So sorry, I'm a little late posting the challenge for May. I have so much going on. I was going to skip out on writing this post, but decided I can't do that. So here it is, short and sweet. 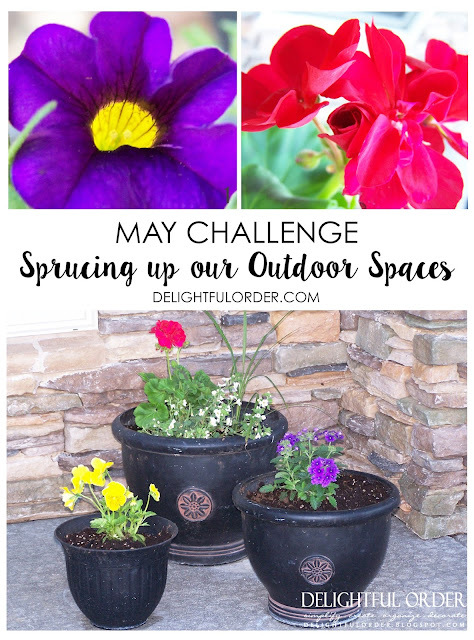 During the month of May, we are going to get our outdoor spaces spruced up, organized and ready for summer! We have beautiful weather, which always makes me want to get outside and tidy things up out there. Bring color to your outdoor spaces with flowers, etc. Okay, ready set, go clean and organize those outdoor spaces! This post is part of the Monthly Organization Challenge. You can join the challenge at any time. Go HERE to see all the posts and bring Delightful Order to your home and life this year. To stay connected, you can sign up to receive emails when new posts are published or follow along on Instagram or Facebook. (Please note that Facebook has made some changes, and you may or may not see all the posts there.) I also have a Monthly Organization Challenge board set up on Pinterest, so you can follow along there as well.